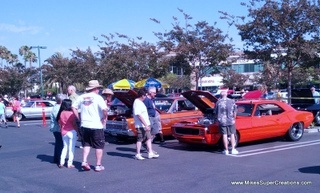 Today, I spent from 8am-2pm at the 1st annual Car Show at Ventura Baptist Church. The event was to benefit the Miracle League. There was a bit over 70 cars present, which was a good tun-out for a local first-year event. It was organized well, had food, drink, music, a bunch of good car dudes, and more. I hope to see the event return next year. I was fortunate enough to take First Place Muscle Car 1967-1969 - the above picture is me with the trophy when I stopped at my office afterwards.